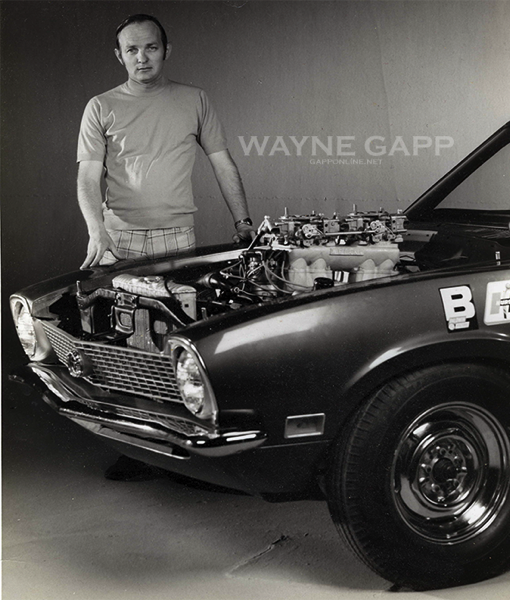 Wayne Gapp – Now booking the Boss 429 Maverick! Found this image out on eBay not to long ago. This car is just beautifully finished. The paint is impeccable. Love it. Just behind the car are three men. 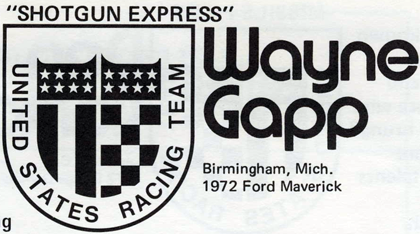 On the left is Wayne Gapp, in the middle Al Buckmaster(?) 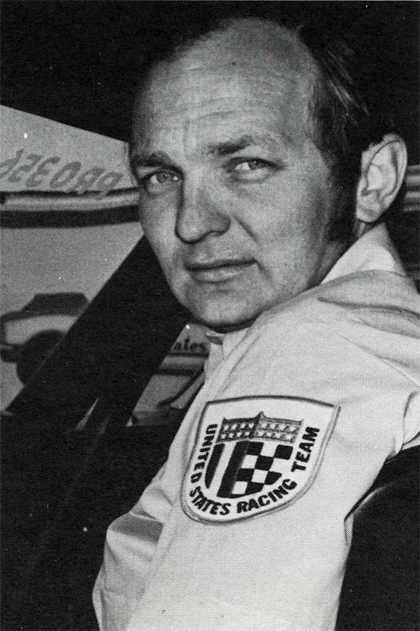 and on the right Jack Roush. 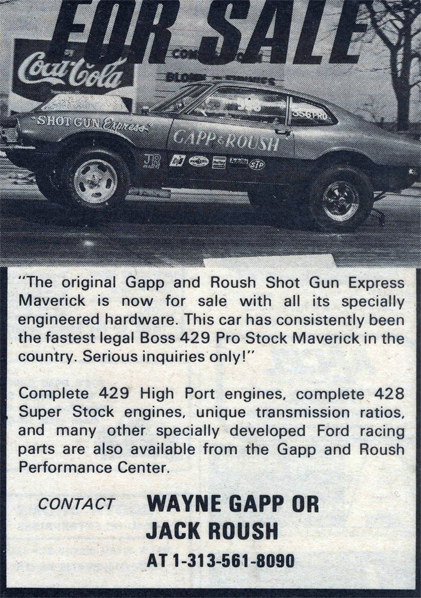 Is THIS a Gapp and Roush Maverick? 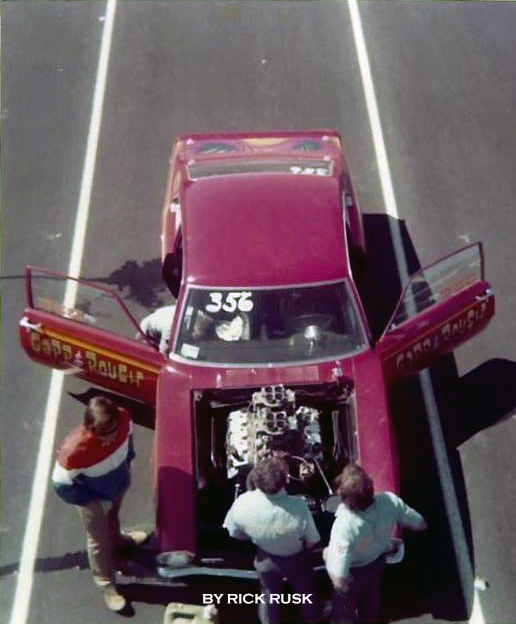 Saw the first picture below on the Nostalgia Pro Stock group on Facebook. 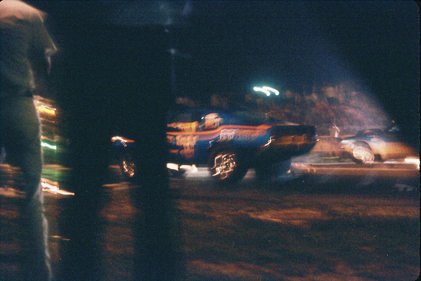 The original image comes from Reed Koeppe, Drag Racing historian. I find the topic to be interesting as I don’t know the location of many of my father’s vehicles. 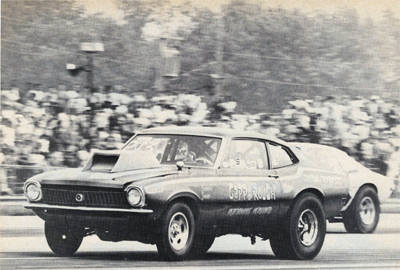 The 69 Mustang body is in the hands of Daryl Huffman. The Cougar has vanished. The Comet Cyclone was scrapped. Brett Hajek has a vehicle but some things on it just look wrong (bumpers, windows). 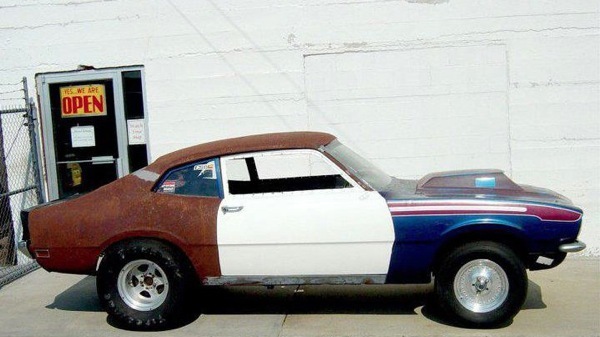 My Dad thinks it’s a match racing car they built. The 4 door Maverick is gone and Roush had a clone put together but it’s not finished. 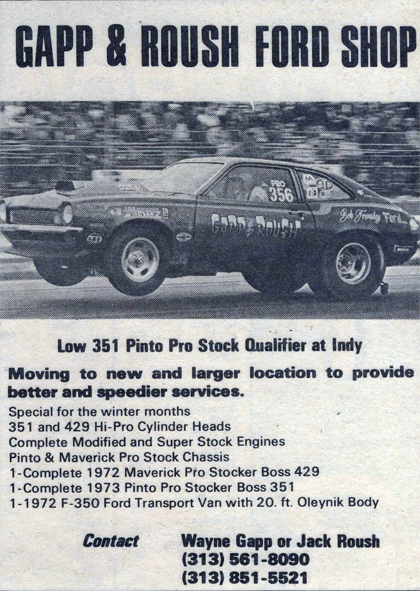 The 1972 Pinto was sold to Glidden. 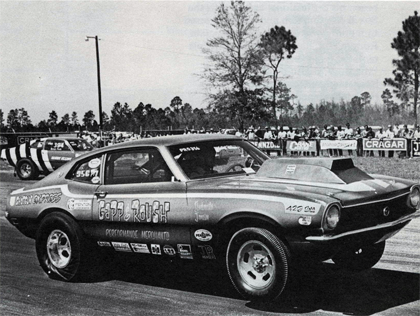 I’ve seen a Glidden Pinto sold recently but don’t know if that car is a rebuilt version of the ’72 original or not. The Super Stock Mustang is in Roush’s hands. That leaves the 1973, 76 and 77 Pinto’s and the Maverick’s. 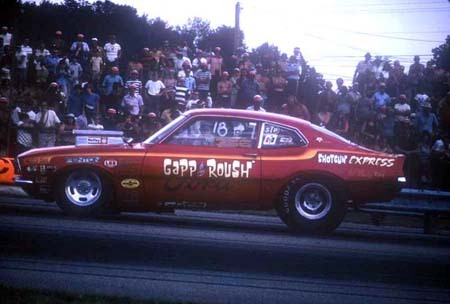 I know that the ‘Red’ Maverick was sold to Jim Halloran but lost it from there. Never knew what happened to the ‘Blue’ Maverick. I would love to get my hands on the Red Maverick. I really like this car. It’s the last Boss 429 ride. The red paint job with the striping looks great. It’s got a clean look to it and though you can’t see it in this picture it has an amazing paint job on the trunk lid. To see that go here and scroll down to the Red Maverick. 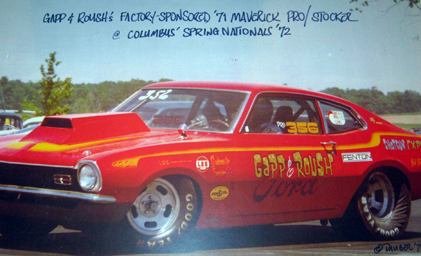 The caption states that Gapp & Roush were sponsored by Ford at this time. That is not the case and as a matter of fact they were NEVER sponsored by Ford. 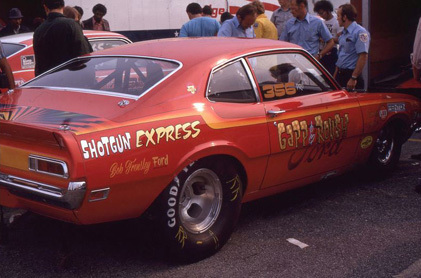 Ford got out racing and that…was that. If the first point is true, why the big ‘FORD’ log on the side? I asked about that. They were trying to get Ford to sponsor them. Never happened.